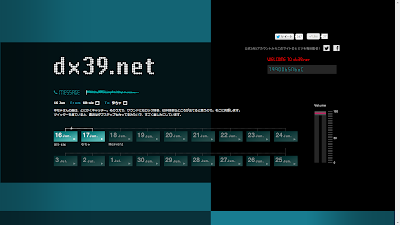 Website dx39.net opened as of 16/5/2013, and contains some interesting content which includes a BGM with bits of Hatsune Miku's voice. Not much has been revealed about this website, but the URL name clearly shows that it is related to Hatsune Miku (being 39 = Miku). Furthermore, the contents of the website are more puzzling, it seems that they plan to release one-phrased music everyday up till 25th of June. And all of the one-phrased music are done by Vocaloid producers. On the opening day (16th of June), tilt-six was featured whereas Yucha was featured the following day. Each music clip comes with a message from the producer of the day to the next producer who will be featured in the following day. It seems we will have to wait up till the 25th of June to see what's the true purpose of the website.